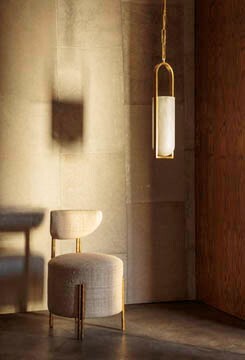 The Nouvel Small Sconce is minimal yet bold, highlighting the juxtaposition of mixed-materiality and curvilinear form. This sconce is available in Antique Brass, Polished Nickel or a combination of Bronze and Brass, each featuring a White Glass globe. This fixture is rated for damp locations. Effortlessly pairing natural alabaster and sleek metal detailing in a streamlined geometric form, the Melange Medium Elongated Pill Sconce exudes a modern refinement while emphasizing the beauty of natural stone. This sconce features hand-carved natural alabaster with either Antique Brass, Bronze or Polished Nickel detailing and is rated for damp locations.